Remote I/O, or distributed I/O, offers several advantages over the traditional local I/O found on a Programmable Logic Controller (PLC). 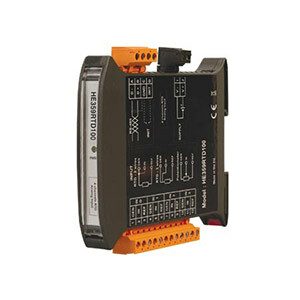 First, it allows you to locate the I/O modules close to the process that is being monitored or controlled. This greatly improves noise immunity, as the weak sensor signals are converted to digital signals before being transmitted long distances through a noisy plant environment. OMEGA universal remote I/O modules use a simple 2-wire RS485 link using MODBUS RTU/ASCII protocol, which is supported by most programmable logic controllers. A second advantage is that remote I/O greatly reduces the wiring at the main control panel, saving time and money when repairs and upgrades are necessary. Adding additional sensors and control signals is as easy as connecting to the already installed RS485 link and modifying the PLC program to utilize the new I/O. In addition, remote I/O allows you to expand your process control system beyond the local I/O capabilities of your PLC. You can add thermocouple, RTD, pressure, and flow sensors to a PLC that doesn’t support these types of inputs. With remote I/O, your process application is no longer dependent on your controller choice.